Red Sox outfielder Mookie Betts on Sunday bowled a perfect game at the World Series of Bowling, a Professional Bowlers Association tour event. The two-time All Star—who ESPN called a “bowling aficionado”—told ESPN he’d estimated it was his 10th perfect game in his life (but his first at a PBA event). Ten perfect games! Is Mookie Betts’s name on bowling alleys across the country? Betts finished 144th in the tournament. 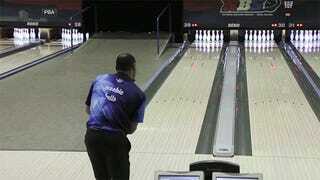 He averaged a 203.1 over 10 games, 13 pins better than his 190 average two years ago.